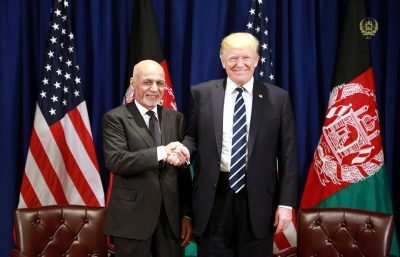 President Donald Trump and Afghan President Ashraf Ghani have voiced support for US companies developing Afghanistan’s vast trove of minerals, in what Trump sees as payment for the US’s role in the drawn out war. The two leaders met in New York on Thursday, where they discussed how American companies can help “quickly develop Afghanistan’s rare earth mineral resources,” the White House said in a statement. Trump has had his eyes on Afghanistan’s vast mineral resources as a way to cover the $117 billion cost of the war and reconstruction efforts since the US began bombing and occupying the country in 2001. Reuters reports that Trump told advisors in June that the US should demand a share of Afghanistan’s minerals as a payment for US assistance given to the Afghan government. In July, the New York Times reported that senior White House aides met with an executive from American Elements, which specialises in mineral extraction, to discuss the potential for Afghanistan. Afghanistan is home to vast deposits of gold, silver, platinum, coal, lithium, natural gas, uranium, tantalum and copper, among other minerals. The US interest in Afghan resources predates Trump. The US Geological Survey reported in 2010 that Afghanistan has mineral deposits worth $1 trillion, which has been touted as the key to the country’s future. A 2007 Pentagon memo cited by the New York Times described the country’s potential as being the “Saudi Arabia of lithium.” A 2006 mineral resource map by the USGS also shows US knowledge of Afghan minerals. What the country lacks is the suitable infrastructure to handle transportation of these minerals, as well as the resources to conduct updated surveys. Many smaller mines in the country are run by private entities whose profits are out of reach of the government. The country continues to fight an insurgency from the Taliban and other groups. The US launched its war in Afghanistan in 2001, less than a month after the 9/11 attacks on the Twin Towers led by Osama bin Laden. “Operation Enduring Freedom” was triggered when the Taliban, who had been in power since 1996, refused to hand Bin Laden over to the Americans. In 2003, George W Bush turned his attention and military toward the invasion of Iraq. This allowed the Taliban and others to regain strength in Afghanistan. The number of US troops deployed to Afghanistan continued to increase until its peak in 2009, when 100,000 troops were sent to Afghanistan. Although Bin Laden was killed in 2011 in Pakistan, the US presence in Afghanistan continues to this day, with troops training Afghan soldiers and fighting terrorist groups. Featured image is from Afghan News Agency.